Indian children since the late 1960s have learnt their religion, mythology and history from brightly coloured comic books called the Amar Chitra Katha (Immortal Illustrated Stories). And now the creator of these hugely popular comics, Anant Pai, who died last year, has been immortalised in a comic-biography. A master storyteller, he was affectionately called Uncle Pai by his young fans. When he launched the first Amar Chitra Katha in 1967 with the story of the Hindu god Krishna, he did not know that he was starting something that would become a phenomenon. Today, with nearly 600 titles and more than 100 million comics sold, Amar Chitra Katha is a household name in India. Despite competition from 24-hour television, video games and international comics, Amar Chitra Katha still sells more than three million copies a year. The idea for the comics came to Mr Pai by chance. During a visit to Delhi in 1967, in a television shop in Karol Bagh market, he saw a quiz contest on the state-run Doordarshan network. "The participants could easily answer questions about Greek mythology, but they couldn't answer a question about who was Lord Ram's mother," he would later say. It upset him and he set out to correct it by creating comics based on Indian stories. "He brought into the limelight stories of our country which needed to be shared and told," says Reena Puri who worked for over 20 years with Mr Pai and succeeded him as the editor of Amar Chitra Katha. The comics drew heavily from religious parables, scriptures and folk tales. Based on stories from the Hindu epics of Ramayan and Mahabharat, they were tales of gods and goddesses and fascinating historical figures. The stories were simply told and easy to read and understand. And they were beautifully illustrated. There were gods and warriors with rippling muscles, beautiful goddesses and queens dressed in colourful robes and exquisite jewels and demons and scheming villains with their scary rages. And in the battle between the good and the evil, the former almost always triumphed. The comics proved a winner from the moment they were launched and in no time grabbed the attention of young readers. To honour the master storyteller, publishers ACK Media have come out with an Amar Chitra Katha on the life of Mr Pai. 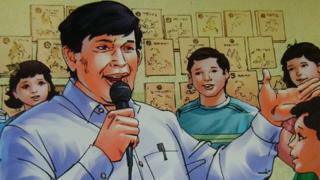 The creator of India's most loved comic books now has his own comic. "What can be the best way to pay tribute to a storyteller? Tell his story," says Ms Puri. The 32-page comic-biography - "Anant Pai: Master Storyteller" - took 11 months to produce and was launched by his widow, Lalita Pai, at the recent Comic Con, a three-day festival of Indian and international comics in Delhi. MS Varadarajan, a visitor from Bangalore, immediately purchased a copy for his seven-year-old son. "I have been a big fan of Uncle Pai and Amar Chitra Katha. I started reading them when I was 10 or 11. And my son is very fond of Krishna tales." Mr Varadarajan gets the comic signed by its illustrator, Dilip Kadam. Mr Kadam, the artist behind more than 100 Amar Chitra Kathas, including the 42-part best-selling series on the mythological epic, Mahabharat, worked with Mr Pai over many years. "Mr Pai was involved in the entire creative process, from the beginning to the end. He would look at the script and the sketches and suggest changes," he says. Born in a Karnataka village and orphaned at two, Mr Pai was raised initially by his grandparents and then an uncle. "He studied chemical engineering, but he didn't want to get bogged down by a job," says Mrs Pai. "He only wanted to learn and teach. He gave up his job to work on his idea. We had tough times, we even went without food sometime, but he was focussed on what he wanted to do." Ms Puri says Uncle Pai was like a walking encyclopaedia. "His memory was huge. He would quote from the scriptures and poetry. He had a story for every occasion. Even when I would do something wrong, he would make me sit down and tell me a story." At the Comic Con, the Amar Chitra Katha stall is busy with browsers and shoppers. Among them are Rohit Dhar and his 14-year-old son Ahaan. Mr Dhar who spent his childhood and early teenage years in Kenya, says the Amar Chitra Kathas were his "only way to connect with the Indian culture in a foreign land". He has read approximately 200 titles and says all his knowledge of Indian mythology comes from them. "They were interesting and fun to read. And the sheer volume of information they provided in a fun way really attracted me." Ahaan reads these comics "to learn about figures I study in history. They help with my history lessons". The Amar Chitra Kathas cemented Uncle Pai's connection with his young fans. Ms Puri says they receive 5,000 letters every month and during school vacations, the numbers go up to 10,000. "Children write to us with their stories and experiences. They even write about their problems. Sometimes they also write saying that so and so story was stupid." In 1994, the Amar Chitra Katha office caught fire and all the artwork and books were destroyed. "We were devastated," says Ms Puri. "We published an appeal in the latest issue of Tinkle - a monthly comic digest launched by Uncle Pai in 1980 - asking children to send us any spare copies they had of the comics." The response they received was overwhelming. "We recovered every single copy of Amar Chitra Katha," she says.